FilibusteredFilibustered is Alex McLevy’s column about the overlap between politics and pop culture. A specter was haunting the first 2016 presidential debate. A disembodied voice, veering in and out of the sound system, disturbing the stentorian remarks of the candidates and pleading for time—just a little more time—if only the people in front of the camera would listen. And at the very end of the proceedings, it materialized: A man, dignified and elegant, nattily attired in a gray suit, who had done his level best to keep this rhetorical freight train on its wobbly tracks. 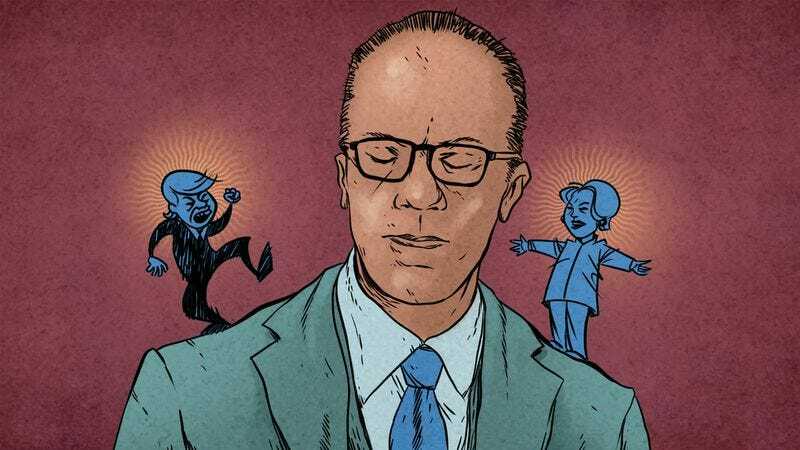 The debate moderator known as Lester Holt had finished his mission, and if a patina of relief sweat dappled his brow, it was more than earned. He’d taken on the most thankless of roles in this most grueling of elections. And he will earn no appreciation for it. Whether you sided more with the divisive, controversial nominee who presided over a serious rift in their party throughout the primary, or you were more drawn to … wait, that’s both of them. Regardless, whatever your particular loyalties, practically no one was on the side of poor Lester Holt. In the days leading up to the debate, one of the biggest questions was the part Holt would play. To a large degree, the uncertainty revolved around how active Holt would or even could be—and specifically, whether he would fact-check the candidates in real time. Vox called it “the task of a lifetime,” and reminded readers of the backlash that Matt Lauer faced earlier this month when he didn’t question the multiple erroneous statements made by Trump during his forum. The Washington Post even published a list of “things to know” about Holt, playing up the fraught nature of his responsibilities. The New York Times weighed in with an argument for calling out falsehoods from both candidates, and it reminded Holt of the incredible stakes by offering more than one comparison to the Super Bowl, given the potential for upwards of 100 million people watching. Yet when it came time, Holt may as well have been wearing a bathrobe and Skyping in his questions and interjections, for all they might have impacted the proceedings. He appeared briefly at the beginning, coming onstage to make a couple of jokes about his nerves and reiterate the debate organizers’ call for silence from the audience, then returned to the cameras several minutes later to introduce the candidates. From there on, the image was a split-screen tableau, unmoving, of Clinton and Trump. All the cable networks followed the same formula, without deviation: Any fireworks or flash had to come directly from the two nominees for president, because nothing else would be offered up for consideration. In some ways, this was a return to an earlier era. In the nascent years of televised presidential debates, a static camera would simply cut between the two candidates as they were given long stretches to lay out their positions. The media was intended to get out of the way of the candidates, to be as invisible as possible, and this remains the prevailing philosophy of many moderators, past and present. Former moderator Chris Wallace has said he believes it’s not their role to involve themselves in separating truth from fiction, but rather to enable the candidates to challenge each other. Even still, the moderators are historically present as an interrogative force, appearing within the visual frame of the TV screen. Nixon-Kennedy, Reagan-Carter, Clinton-Dole—the camera has traditionally cut back to the moderator in between responses, when whichever journalist has been waiting patiently through the talking points gets their brief moment to shine, by dint of reading their own pre-written words off a page without slurring them. (In the case of 1996, Jim Lehrer would periodically appear, his back to the camera, in the lower left side of the shot, a mysterious presence who strangely dominated the stage as though working a Nintendo controller that extended to both podiums.) But on Monday night, Holt was banished from the frame and rarely glimpsed, his voice the sole reminder there was an actual human there who was charged with bringing some order to this combative exchange. This near-complete absence made it especially interesting when Holt actually stepped up and refused to let Trump dissemble. Holt’s biggest intervention came when Trump continually—and falsely—presented two things: first, that Clinton was responsible for the birther nonsense; and second, that he had always been against the war in Iraq. Both times, Holt would dart into the fray of Trump’s bumptious bloviating with speedy, incisive interjections, desperately trying to provide a quick antidote of logic to a churning roil of infectious horseshit. Both times, Clinton just held back and let Trump run roughshod over his attempt to appear put together, though she couldn’t help a creeping smile, the kind born of the knowledge that your opponent is busily shooting himself in the proverbial foot. Even the audience couldn’t maintain their credulity in the face of Trump near-shouting that he possesses the calmer temperament. Still, for the first third of the debate, Holt was a model of restraint, only chiming in when Clinton or Trump would sail past their allotted time, and essentially let them snipe at one another for a good half-hour with only minimal interruption from him. It certainly made for compelling television. Trump is nothing if not a seasoned performer, and in the early going, he was energetic and on message, hammering Clinton as an avatar of the “talks a big game, but hasn’t done anything” school of governmental ineptitude. Meanwhile, Clinton alternated between sharp-tongued rejoinders and awkward pat responses, sometimes seeming every bit the savvy contender, and in other moments retreating into failed attempts at “there you go again” Reaganisms. It was during this time that Holt effectively vanished into the woodwork, even his occasional redirects between the two more flips of a dial than intrusions of voice. All of this will make it doubly ironic whenever Trump inevitably uses Holt as a scapegoat for anything that didn’t go his way. It’s not just that Holt was the epitome of minimalism, only speaking up when Trump really crossed the boundaries of arguable logic into outright lying. Trump—as part of a pattern of declaring democracy dysfunctional, except when it benefits him—tried to tar Holt with the same dismissive brush he uses to decry any effort to call him out for his lies. “Lester is a democrat… It’s a phony system. They are all democrats. It’s a very unfair system,” Trump said to Fox News earlier this month, ignoring the easily researched fact that Holt is a registered Republican. Much like with Megyn Kelly, Trump’s efforts to smear a journalist tasked with questioning him backfired. At the very least, it failed to fit the predetermined narrative his followers seem all too willing to let him blithely invent, logic be damned. But as with so many other untruths, it’s unlikely to convince those supporters that Holt—as part of the “mainstream media” that Trump complained last night was practically running Clinton’s campaign—didn’t play a role in making him look bad.